Chamomile tea benefits the body, skin and hair! It's a caffeine free drink, golden in color, with a delicious fruity flavor. 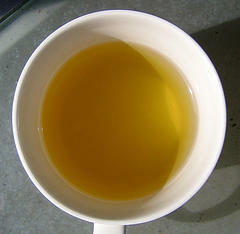 Approximately, one million cups of chamomile tea are consumed annually. Find it in your local grocery store plain or blended. It has been recognized for centuries. Chamomile is anti-viral, anti-fungal, anti-microbial, anti-spasmodic and anti-inflammatory. It's packed with antioxidants! It's rich in quertin, (a photochemical giving color to fruits and vegetables). It fights damage caused by free radicals. It contains glycine, an amino acid, that helps maintain a healthy nervous system. Combined with a hint of lemmongrass, this tea soothes nerves, relieves tension and stress. A relaxing blend of chamomile tea combats insomnia. The word chamomile is derived from greek origin, meaning "earth-apple on the ground". The plant has a sweet, apple, scent and looks like a daisy. The bloom in the early to mid Summer months. Chamomile is found in Europe, Asia, North America and Australia near roads, landfills or fields, as a weed. It's other names include: Wild Chamomile, Hungarian Chamomile and Pineapple Weed. Two plants fall under the chamomile name: Matricaria recutita, (German chamomile) and Chamaemelum nobile, (Roman chamomile). German chamomile is an annual plant while Roman chamomile is a perennial. Both come from different species of plants but they're very similar in appearance. They're used interchangeably to treat similar conditions. Discover health benefits of tea for the body, skin and hair! Learn the Chamomile tea benefits, now! ALLEVIATES: sore stomach, irritable bowel syndrome, heartburn, menstrual cramps, back pain, colds, migraines, muscle spasms, rheumatoid arthritis, asthma, sinus infections, toothaches and insomnia. Chamomile has extremely effective skin healing, purifying and antioxidant properties. It helps get rid of blackheads and diminish acne scars. It helps speed the healing time of minor wounds, reduces skin damage caused by free radicals, (wrinkles, fine lines), lightens skin tone, soothes burns, soothes skin irritations, (hives, bee stings, acne, scrapes, rashes), reduces redness, reduces dark circle under eyes, reduces under eye swelling and puffiness. It's useful for sensitive skin. It alleviates skin diseases, including the mouth and gums. It's used in mouthwashes or for gargling. Roman and Blue chamomile essential oils have skin healing properties. Blue chamomile essential oil has a high content of azulene which bears a blue color. This chamomile is derived from the German chamomile plant. Some Blue chamomile were bred for medicinal products only. #1: Blend cooled Chamomile tea with powdered milk for an exfoliating paste. Apply, evenly, to face avoiding eyes, ears or other sensitive areas. Rinse with cool water. Gently pat dry. Soften and soothe skin. Good for all skin types, including sensitive skin. #2: Place cooled Chamomile tea bags under eyes to reduce puffiness. #3: Add chamomile to make homemade skin care products: soaps, lotions, creams. Combine tiny pieces of chamomile leaves to add a speckled looked to your homemade soap. Combined with other natural, ingredients, your soap may be a homemade acne remedy! Add Roman chamomile extract, with other natural ingredients, to make a homemade face cream. Soften, soothe and moisturize skin with healthful nutrients. #4: Reduce redness of acne by placing a chilled chamomile tea bag, directly, on affected area. #5: Reduce visible signs of acne scars by rubbing cooled chamomile tea on affected areas. Chamomile helps lighten skin and reduce visibility of marks left from acne flare-ups. CAUTION! Never use hot Chamomile tea on skin. Avoid burns & blisters! Chamomile is an ingredient used for blond hair treatments. It lightens and brightens hair, gradually, when used as a rinse. It adds golden highlights to brown hair with continual use. Chamomile is found in commercial or homemade shampoo. It strengthens hair and helps repair split ends. It promotes a healthy balance between dry and oily scalp conditions. It soothes irritated scalp. Roman, German and Moroccan chamomile oils are used for aromatherapy. Moroccan chamomile isn't from a true chamomile plant. It's mainly found in perfume blends or used for aromatherapy. A few drops of chamomile oil in warm bath water helps relax senses. Calm nerves by inhaling dried or fresh chamomile. Massage therapists it with other essential oils, like lavender or tea tree. Muscles and joints are soothed and inflammation reduced. Nerves and irritability are calmed. Chamomile is used in potpourri, air fresheners, diffusers, bath oils, soaps, lotions, perfumes, creams and more. Chamomile is found in pet shampoos and conditioners. It shines and softens fur. It relieves dry itchy skin and other skin irritations. It conditions and deodorizes. It can be blended with soothing ingredients, oatmeal or aloe vera. Promotes healthy skin & hair. CAUTION! Chamomile can have possible side effects, including allergic reactions. Avoid chamomile when pregnant, on blood thinners, if allergic to ragweed or pollen. Discontinue use and seek the help of your health care provider, (for you or your pet), if needed.